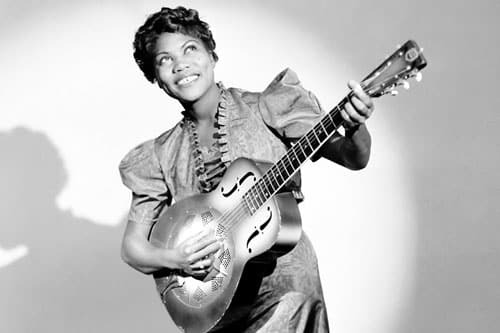 Born in 1915 in Cotton Plant, Ark., Sister Rosetta Tharpe (as she became known) was the child of African American cotton pickers. Little is known about her father, but her mother, Katie Bell Nubin, was an extremely important figure in her life. Katie was a congregant of the Church of God in Christ (COGIC), a black Pentecostal church, where she sang and preached in services that encouraged rhythmic music and “dancing in praise.” At age 4, Rosetta was celebrated in her community as a music prodigy, singing and playing guitar in church alongside her mother. By age 6, Rosetta was billed as the “Singing and Guitar Playing Miracle” and mother and daughter traveled throughout the South as part of a touring gospel and sermonizing group. They settled in Chicago in the mid-1920s and performed at the 40th Street COGIC. Rosetta’s extraordinary talent created quite a stir in gospel circles and her fame began to grow. At 19, she married a COGIC preacher and by all accounts the only thing she got out of the marriage, which only lasted a few years, was her husband’s last name, “Thorpe,” which she altered to “Tharpe” and adopted it as her stage name. In 1938, Katie and Rosetta settled in New York City and that year Rosetta recorded for the first time. The four sides on Decca were smash hits, including “This Train,” which propelled her to instant stardom and a long-term recording contract. Unfortunately, her combination of gospel-inspired lyrics with more profane music infuriated many of her core gospel audience, black churchgoers, who refused to support her as they found the non-gospel material blasphemous and were angered that Rosetta sang gospel lyrics in nightclubs that were “dens of sin.” Her cross-over to the secular side, however, greatly enlarged her overall audience, as many of her new white fans and had never heard black gospel music. She began to play an electric guitar and her playing took on more of a blues influence. Rosetta combined a driving rhythm with guitar licks that had an “attitude” and a commanding visual presence that presaged the guitar antics of rock musicians in the 1950s, while she sang gospel lyrics. She toured with gospel singer Marie Knight during the 1940s and they were billed as “The Saint and The Sinner.” Guess who was the Sinner. She claimed that she was contractually obligated to perform the type of material she was then performing, but the truth was a little more complicated than that. While Rosetta was deeply religious, she was also someone who loved the “swinging feel” of the blues and when performing, her exuberant manner and radiant smile transmitted an aura of heavenly pleasure, whether she was performing sacred or more worldly music. She had an extensive performance, recording and touring career well into the late 1960s, with a few ups and downs along the way. In some ways her life was not unlike the struggles described in the bible that she sang about – between good (sacred music) and evil (jazz/blues/R & B) and during most of her career she lurched back and forth between the two musically, and some would say, the same applied to the choices she made with respect to her personal life. She had a second failed marriage and there were rumors that she was bisexual and only married for appearance sake. As a publicity stunt in 1951 she married her third husband who was her manager before 25,000 people who paid to view her wedding at Griffith Stadium in Washington D.C. and then stayed for the concert that followed. By the late 1950s her career appeared to be coming to an end, but she was given a reprieve in the 1960s when European audiences began to embrace American blues and she toured extensively on the Continent during that decade. Suffering a stroke in 1970, Rosetta never fully recovered, performing sporadically until her death at the age of 58 in 1973. Tragically buried in an unmarked grave, totally forgotten by her fans who had moved on to R&B and rock ‘n’ roll, Rosetta’s legacy appeared to have been buried with her. A black female guitar playing gospel singer didn’t easily fit the narrative of what the mainstream media was focused on in the 1970s. However, in the 1980s and 1990s when the early rockers such as Elvis, Chuck Berry, Little Richard and Jerry Lee Lewis began to tell the world that they had been greatly influenced by Rosetta, the media took notice. By 1998, the U.S. Post Office issued a commemorative stamp in Rosetta’s honor. NPR broadcast several segments honoring her. She was inducted posthumously into the Blues Hall of Fame. Her biography was written and a documentary film followed. Thirty five years after her passing, a benefit concert in Rosetta’s memory was organized and funds were raised to place a headstone on her grave. 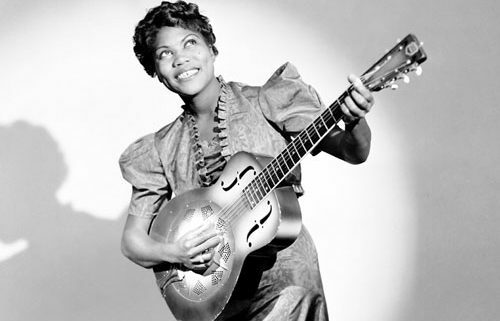 Today Rosetta is not forgotten as she is now acknowledged as a pioneer who brought black gospel music to the masses in the 1930s and 1940s and most importantly that she was a women who broke down gender barriers as a guitarist who is now saluted as the “godmother of rock ‘n’ roll,” establishing herself as one of the most influential gospel/blues singers and guitarists of the mid-20th Century. At 9 a.m. on Sept. 3 at Vail Square in Lionshead, Vail Jazz will once again present Niki Haris’ Gospel Prayer Meetin’. Niki will be joined by a gospel choir and an all-star band and will perform songs by Sister Rosetta Tharpe and other gospel greats in what promises to be an inspiring gospel show.